In the 2012 IMSC meeting (15-21 September 2012) Dr. Alexander Fialkov and Prof. Aviv Amirav present, among other things, the dramatically improved petroleum-sample analysis performed with the 5975-SMB GC-MS with Cold-EI. A brief abstract of the presentation is given below and we shall be happy to provide our full power point presentation upon request. Title: "Dramatically Improved Hydrocarbon Analysis with the 5975-SMB GC-MS with Cold EI"
The Aviv Analytical 5975-SMB GC-MS with Cold EI provides enhanced molecular ions for all hydrocarbons and thus enables their improved analysis including their isomer distributions. In addition, isomers and structurally related fragments mass spectral peaks are exhibited which enables NIST library identification. Furthermore, extended range of compounds are amenable for analysis with short column and high column flow rates, including low volatility large oil and wax compounds that cannot be analyzed by standard GC-MS. In addition, the 5975-SMB GC-MS enables much shorter analysis time and improved sensitivity that could be up to and over three orders of magnitude better on the molecular ions of large hydrocarbons. The figure above compares Cold EI (upper traces) with Standard EI (bottom traces) in the analysis of a Petroleum related hydrocarbon mixture. (60 m column 1.2 ml/min flow rate in Cold EI). 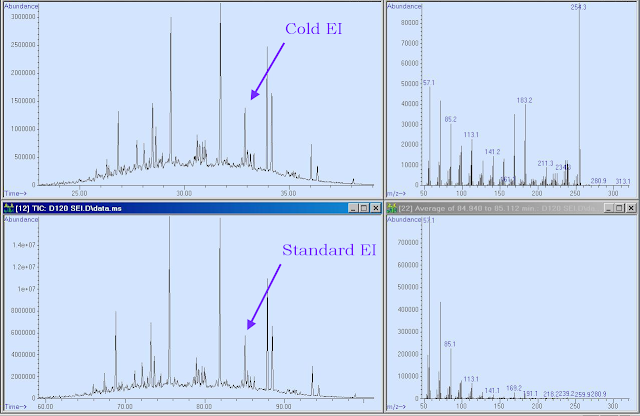 While the TIC mass chromatograms are similar, the Cold EI mass spectral content is dramatically improved. The mass spectra are of the isoprenoid isomer of C18H38 with MW=254.3 and while the molecular ion is not observed in standard EI it is the dominant mass spectral peak in Cold EI. A closer look at the standard EI-MS reveals that its molecular ion relative abundance is 0.12%. Such large (three orders of magnitude) sensitivity gain of Cold EI plus its more uniform response enable isomer distribution analysis which is a novel and effective technique for fuel and oil characterization.